Great Rates! Walking Distance to Tenaya and Southern Gate! Dogs Welcome! Property 1: Great Rates! Walking Distance to Tenaya and Southern Gate! Dogs Welcome! Property 3: Wildflowers and waterfalls abound! Property 5: Lovers’ Cabin; Gateway to Yosemite National Park and more! Property 7: 1893 vineyard cottage at the gateway to Yosemite. 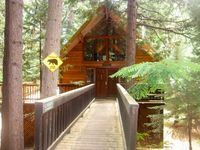 Property 11: Luxury Yosemite Log Cabin ~ 2 Miles to Yosemite Entrance~ Now Booking!! Property 14: The Herrera Hideaway: a Shaver Lake cabin! Adventure begins here! Property 19: Charming Mountain Chalet with Modern Conveniences in the Heart of Shaver + WIFI! Property 22: "Yosemite's Suite Retreat" Gingerbread Tiny House Perfect for 2! Property 30: Yosemite's Big Rock Cabin - Less Than 2 Miles from the South Gate! Property 32: Sweet family home w/ spacious deck - right in the village, walk to the lake! Property 34: Cozy Cottage close to Yosemite, Beautiful Views, Hot Tub & More! Property 38: A classic forest cabin with modern amenities - the best of both worlds! Property 43: Peaceful Yosemite Pines Retreat, HUGE YARD, POOL, SPA, PLAY AREA and PONIES! Property 48: YOSEMITE Sugar Pine Cabin, 7 Miles To The South Entrance Of The Park. Property 50: Cozy cabin for two with furnished patio - close to the village and the lake!